Was doing my grocery shopping when I spotted these at the snack section. Lay's, a subsidiary of Pepsico offered some unusual flavours to tempt the local palates. 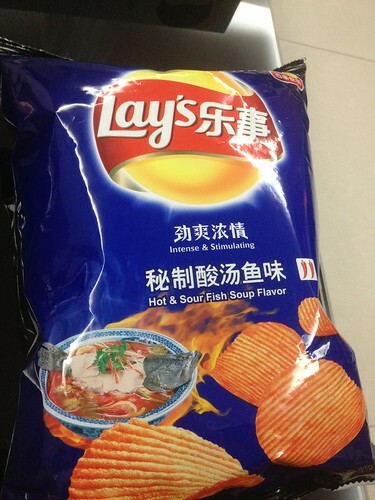 Hot & Sour Fish Soup flavour. Errr..... I have heard of Fish & Chips but never would I have imagined that it would turned out to be like this. 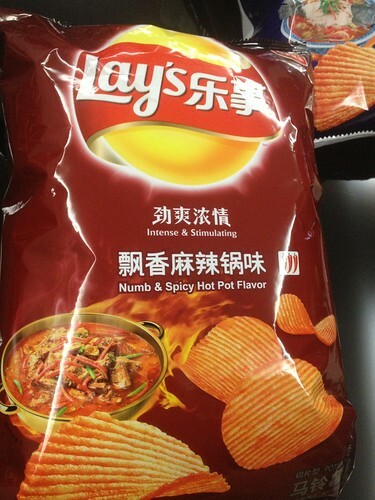 Numb & Spicy Hot Pot translated to human language is 麻辣火锅 flavour where they added Sichuan peppercorn to the condiment spices. So verdict? Frankly speaking, they are quite yummy (imma MSG junkie) but I couldn't tell the flavours apart. The whole snack was so loaded with condiments that my tongue went under local anesthesia. LaDyReD: Yeah... there's quite a shitload of sodium in there. Yum.